Dear Daddy – The first Sunday of the new year. Weather clear but temp. around 45°. I took David out for a few minutes – He hasn’t had any temperature for three days, but has a little cough, sounds like it is right in his throat. He has lots of pep and loves to go bye bye – He hadn’t been out all week so thought some fresh air would be in order. Mark had gone to the pond to skate so I walked over to see how he was getting along. He had been out about 2 hrs. so had him come home. He had a cold the first of the week, so thought he shouldn’t stay out so long. John as usual stayed in and listened to the Sunday musicals. Mr. Zell brought home most of a freshly butchered hog and Mrs. Zell had to can home of it – I helped her a while – She has her hands full. Betty came home from her grandma’s with flu and with Virginia still in bed, and fresh pork to be canned, Mr. said if it were sub zero weather they wouldn’t have to hurry with it. They gave us a nice big roast out of a ham. They are going to put some meat in our locker. The new locker here is going to be put in right away. John heard it is to go where the Ford garage has been. I suppose center doesn’t have enough business to stay. Marg Kruman is getting ready to go to Fla. Also Mrs. Plummer says they are trying to go in Feb. this year. 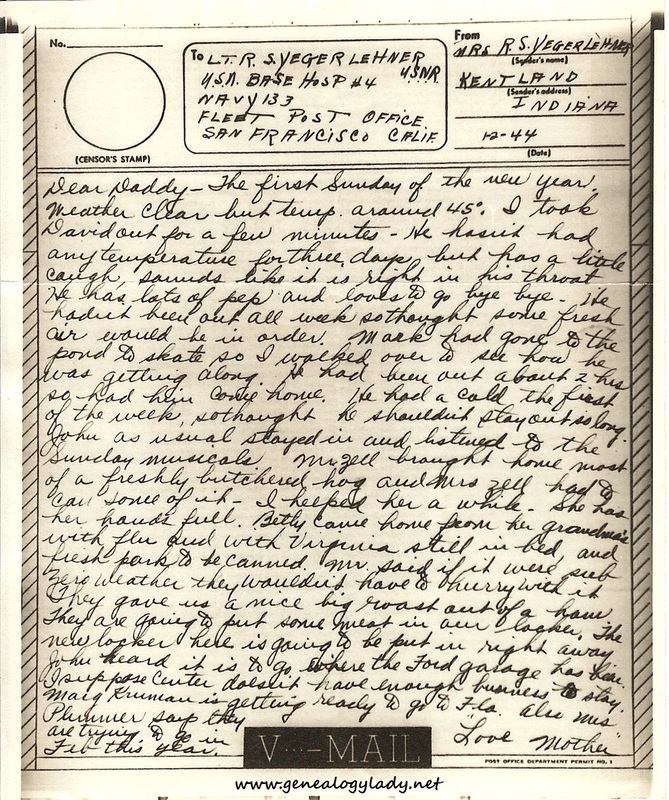 This entry was posted in Foster, Genealogy, World War II, World War II Letters, Yegerlehner and tagged David A. Yegerlehner, Elizabeth Zell, Ethel (Taylor) Plummer, genealogy, Gladys R. (Foster) Yegerlehner, Indiana, John F. Yegerlehner, Kentland, Margaret (Servies) Kruman, Mark A. Yegerlehner, Norma Zell, Roscoe S. Yegerlehner, Russell Zell, Virginia Zell, World War II, World War II letters on September 14, 2015 by Deborah Sweeney. Mrs. Zell sure had to do a lot of canning. I mostly heard about the vegetables from their garden, but part of a pig? That would actually be pretty daunting. Seems like Florida was a favorite destination even then. Yeah, the canning of the pig seems impressive….